"Know thy self" Discovery of the self... ultimately it is each of our individual and deeply personal rites of passage which both reveal and create who we are. Lisa's Art: "Revelation of Truth- Beginning To See"
"No matter how vast your knowledge or how modest, it is your own mind that has to acquire it. It is only with your own knowledge that you can deal. It is only your own knowledge that you can claim to possess or ask others to consider. Your mind is your only judge of truth and if others dissent from your verdict, reality is the court of final appeal. Nothing but a man's mind can perform that complex, delicate, crucial process of identification which is thinking. Nothing can direct the process but his own judgment. Nothing can direct his judgment but his moral integrity." this is the work. the great work of knowing ourselves. The profound internal questions: Who am I? Why am I here? What is my purpose? Why do I exist? What is spirit? psyche? divinity? these penetrating spiritual questions have been asked and explored by so many before us. how do we discover answers for ourselves? how do we truly know for ourselves... consciously living the process of exploration, fully embodying in mind, heart and actions, the answers we receive along the way? Our internal spiritual, Physical, mental and emotional process of growth, also known as the monomythical hero's journey, is naturally built into the construct of ones life. deep questions begin to reveal answers as we move through our initiations to both create and reveal the truth of who we are. this is why we are here. to discover & remember. To experience separation from the source of which we are apart, yet re-immerse with and re-discover what that source truly is. we experience this both within ourselves and outside of ourselves... through this journey of discovery we can come to know our smaller 'separate' self and greater connected self. ultimately marriage of these aspects of small self and great self occur & wholeness of our consciousness results. Natural intelligence is revealed through Universal Laws within the make-up of all Consciousness itself. a soul-knowing of conscience that is not taught from any outside influence, it is innate and heart-felt to our spiritual-core. this soul-compass is always present as we journey, no matter our choice to connect with it or not. whether we are somewhat aware subtly or otherwise, we can sense macro and micro consciousness, within and without, above and below. this journey of what we are and what we are not, allows for remembering ourselves as apart of source... however, true embodiment (Living that wisdom & Being it more completely) requires we realize it from this unique incarnated perspective, then hopefully put it into practice as a gift for other souls to learn from...truly, this is the larger goal. some of the great esoteric philosophers and spiritualists before us, realized the complexities and pathologies of our individual and collective psyches...we can learn and build from their knowledge as a means to assist in our individual growth processes. not all will choose this route of course, each one's journey is unique to them, but for one who Cares to research at depth it can hold much benefit. There inevitably comes a point where we are blind to our blindness, blocks occur along the path... what do we do when we hit that proverbial wall? trusted practitioners- the spiritualists of our day- the true shamans, coaches, healers and/or practitioners can assist us in the deeper embodiment of this knowledge through various practices. if used wisely, they might provide a needed extra boost for us as we move forward in self-discovery. 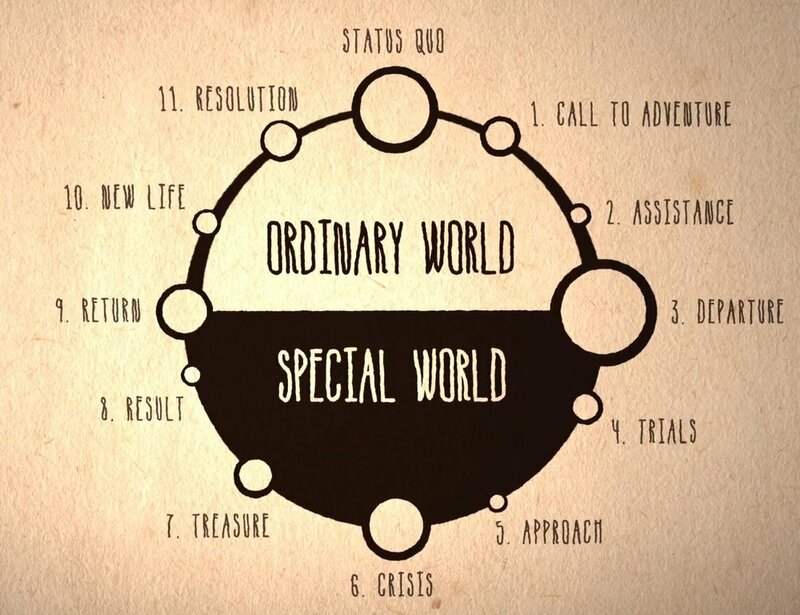 For further information on the monomyth or hero's journey, research the works of Joseph Cambell.